The other day, I was listening to the French radio and I learned that the word livre, book comes from the Latin word liber which means free. This week, I want to show you a bit of my culture, the French culture, from fashion to sport to food. When you understand the culture, you understand the language too and vice and versa. It’s been freezing cold this week, il a fait un froid glacial ! So it is the perfect time to be reading a good book by the fire, au coin du feu. French story and poem: un amour qui finit mal ! 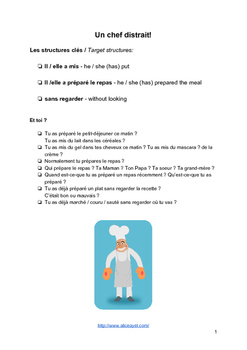 My French students are now learning the passé composé in class and I am looking for ways to help them acquire this new tense without doing the traditional grammar approach. The first text which came to my mind was Le déjeuner du matin which is actually a poem widely taught in French classes because the language is quite simple and repetitive. I am teaching Spanish language B IB higher level and my students have to read two works of literature. Since I have a group of only girls, I have chosen La casa de Bernarda Alba which is written by the famous poet Federico García Lorca.